The Intertops brand was established in 1983 and has been online since 1996. Intertops was actually the first company to take an online wager! 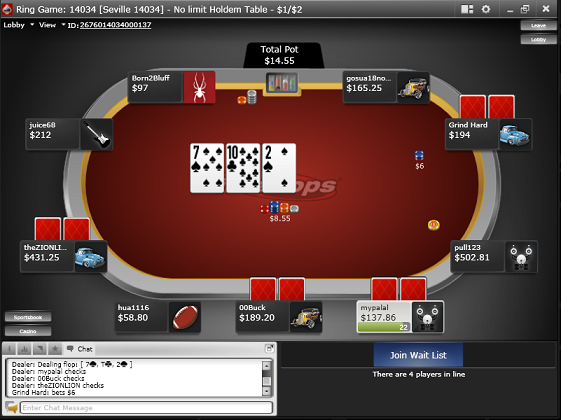 The poker room runs on the Revolution Poker Network and experiences good site traffic. The Intertops Poker room also has a great loyalty program where you earn tournament tickets, merchandise and more importantly CASH! Intertops Poker is offering our new players a 200% match on your first deposit up to $1000. The bonus is also the easiest poker bonuses to clear. To claim your bonus click any of links here within our Intertops Poker review. See below for in depth Intertops Poker Review. Intertops Poker is offering a 200% match sign up bonus up to $1000. An Intertops Poker bonuscode is not needed. 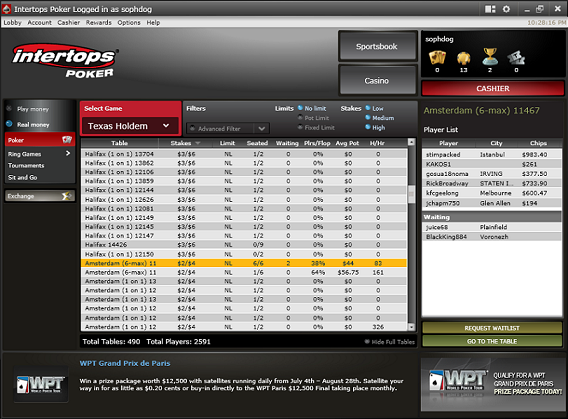 To clear the Intertops Poker bonus you must earn Frequent Player Points or FPP's. Earn 1 point for every dollar of rake generated in cash games and 7 points for every one dollar paid in tournament fee's. Earn 167 FPP's and $10 of your bonus is released. That equals earning $1 of your bonus for just $2.38 paid in fees - not to bad! Also, being part of the Revolution Poker Network, all other promotions apply as well such as Gold Cards and Gold Chips, which can be used for tournament entries, and Gold Cards which can be redeemed for cash, prizes and tournament entries. Intertops Poker offers some good banking options for USA players. USA Credit Cards work fairly well and you can also deposit by Western Union or Money Gram. International players have many more options including MoneyBooks, NetTeller ECO Card and many more. Withdraws are processed fast. We have used both check by courier and the ACH option. ACH withdraws were in our account within 3 business days and we received checks within 5 business days. Intertops has very good withdraw methods that are speedy. We were very pleased with the speed of receiving our withdraws during our review process. Intertops Poker offers NL, PL and Limit Texas Hold'em, Omaha, Omaha Hi/Lo, 7 Card Stud, Stud Hi/Lo. Tournaments are offered 10 seated, 6 seated and Head's Up. A great money management tool is the "Double Up" sit n' go tournaments. These tournaments are 10 seated and the top 5 finishers double their buy-in amount. You can also find Turbo and Ultra Turbo sit 'n go's as well as deep stack and short stack tournaments. If you want super fast play you can join a Hyper-Turbo tournament where the blinds increase every 2 minutes and you start with $500 in chips. Also being part of the Revolution Network the games can be pretty juicy with soft competition. If you play solid poker you can do really well in ring games. Lower level sit n' go tournaments can be loose as well, especially head's up up to the $50 buy-in range. Intertops also offers a Casino and Full Service Sports Book. Being part of the Revolution Poker Network, Intertops has fair to good site traffic. Ring games can be found up to the $10/$20 blind level on a regular basis. Sit n' Go tournaments can be found up to the $200 buy-in level even at off peak times. With the larger poker sites recently leaving the USA market, Intertops and the Revolution Network in general have seen the number of players increase dramatically. In business since 1983 speaks for itself. You can't make it in this business for that long if your not offering superior customer service. Reach the service staff by e-mail at poker@intertops.com by calling 1.800.819.0919 or by LIVE Chat. During our review e-mails were answered within 3 hours and the phone operators spoke very good English. Sign up at Intertops or Download Intertops Poker now. We hope you found our Intertops Poker review informative and it answered any questions you may have had. Intertops is a solid brand and you can rest assured your funds are safe.